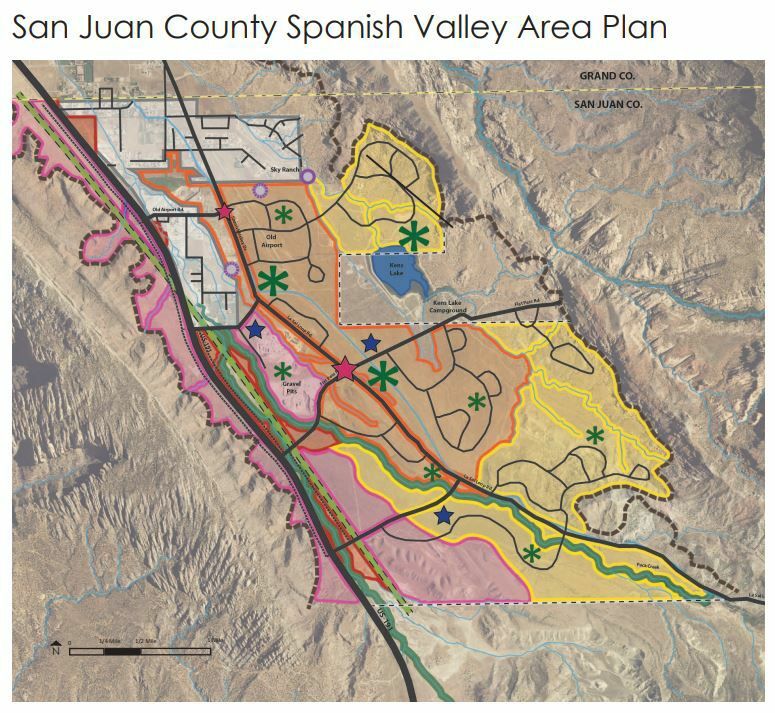 An $11 million water and sewer infrastructure project may sound excessive for the few hundred homes and scattered ranch lands that currently make up the unincorporated area of Spanish Valley in northern San Juan County. But, San Juan County and the School and Institutional Trust Lands Administration (SITLA) have been pursuing a development plan for the 15-square-mile area that could see growth with as many as 6,000 residents in the coming decades, possibly outpacing the current population of nearby Moab. The county secured $5.1 million in grants and low-interest loans from Utah Community Impact Board (CIB) and the Utah Division of Drinking Water to develop underground water rights in the valley last year. And, a $5.9 million sewer project is being built with funds from the CIB and the Utah Division of Water Quality that will utilize the new sewage treatment plant in Grand County. “There will be a great deal more growth once the water and sewer lines hit,” Grand County Building Department Chief Inspector Jeff Whitney told the Moab Sun News last year when the projects were in their initial phase. To prepare for the growth, SITLA, the largest landowner in Spanish Valley, partnered with San Juan County in 2017 to begin mapping out a development agenda for the 5,000-acres of state lands in the valley. SITLA also contributed $2.2 million towards repaying the water and sewer loans, according to the San Juan Record. County officials hired the Salt Lake City-based landscape architecture firm Landmark Design to put together a growth and zoning proposal, which SITLA adopted in April 2018. The plan identifies areas to zone for commercial, denser residential, and perimeter neighborhoods, according to land type and proximity to U.S. Highway 191. It also outlines areas for open space, parks and community services. On March 19, the San Juan County Planning Commission recommended that the county commission adopt four ordinances to formalize the zoning, which became the subject of a heated discussion at the county commission meeting in Monticello. Sarah Fields, a former Spanish Valley resident who recently moved to Monticello, asked for the agenda item to approve the ordinances instead be tabled, because the ordinances were not available for the public to read 24-hours prior to the meeting. Five residents of Pack Creek Ranch told the commission they had only learned of the plan, despite several years of planning and the construction of the sewer and water project, in recent discussions. Connie Witt, one of the Pack Creek residents, apologized for not tracking the process. “I’ve been a resident for a long time, but I’ve not been doing my civic duty by being here first-hand to hear all this as it’s gone along,” she said. Witt went onto explain that residents of northern San Juan County, where Spanish Valley and Pack Creek Ranch are located, tend to follow Grand County and Moab politics. Other Pack Creek residents voiced concerns about the development’s impact on raptor habitat, archaeology, flooding and changes to the rural aesthetic of the valley. A 30-year-old airstrip near a growing residential neighborhood was the focus of other comments, as were the yet-to-be-finalized plans to build a Love’s Travel Stop for semi-tractors near Sunny Acres Lane, also on SITLA land. Jeff Mattson of Pack Creek Ranch was particularly concerned about the San Juan County Planning Commission’s decision to remove a dark skies ordinance from the agenda items. “Light pollution knows no development boundaries,” he said. A SITLA representative, Bryan Torgerson, said the dark skies ordinance was removed because SITLA can voluntarily adopt it. San Juan County commissioners Kenneth Maryboy and Willie Grayeyes, who weren’t yet elected when the Spanish Valley Area Plan was adopted in 2018, asked numerous questions of the SITLA representatives and Landmark Design landscape architect Mark Vlasic, who attended the meeting. Bruce Adams, the incumbent commissioner, encouraged his fellow commissioners to vote for the ordinances. Grayeyes and Maryboy appeared to be swayed by the citizens’ comments, however, and declined to second Adams’ motion to approve the ordinances. Grayeyes said he was “staying neutral,” but that he concerned about the removal of the dark skies ordinance. Maryboy recommended holding another public meeting in Spanish Valley. The failure of the commission to pass the ordinances frustrated county officials who had been involved in the plan for the last several years. Planning commission member Walter Bird said the ordinances were discussed at five meetings and two public hearings since November. “I feel like these people at the nth hour are holding up a year’s worth of work saying they didn’t know, when they didn’t make the attempt to know until this meeting,” Bird said. “It is obvious we need a little bit more education as there are some misunderstandings about this plan,” Vlasic told the Moab Sun News after the meeting, adding that he was looking forward to working with county residents and the commission to help them understand the planning process. The San Juan Planning Commission will hold a public hearing to discuss the ordinances on April 3 at 7 p.m. in the Grand Water and Sewer Service Agency office building at 3025 E. Spanish Trail Rd., in Moab. When: Wednesday, April 3, at 7 p.m.
Where: Grand Water and Sewer Service Agency, 3025 E. Spanish Trail Rd.